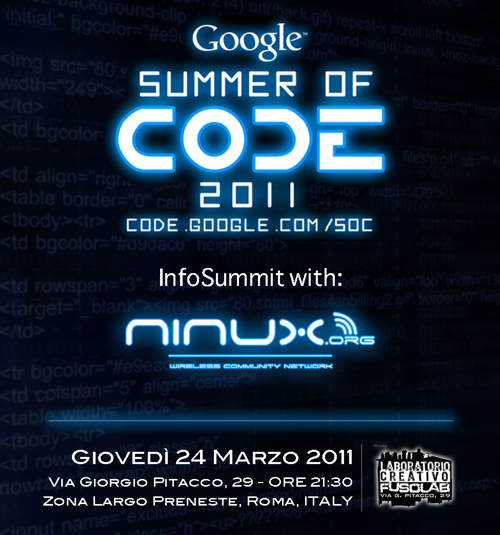 Anche per il 2011 Ninux.org partecipa al Google Summer of Code nell’ombrello di Freifunk, la wireless community tedesca che è stata accettata da Google come “mentoring organization”. This entry was posted on Monday, March 21st, 2011 at 9:06 pm	and is filed under Uncategorized. You can follow any responses to this entry through the RSS 2.0 feed. You can leave a response, or trackback from your own site.